They say the cupcake trend is on its way out now that Crumbs is likely closing. I say there’s one more cupcake to try before you decide that cupcakes are passé. You may just decide that sort of uninteresting overly large cupcakes are dead but yummy cupcakes with the best frosting ever are timeless. 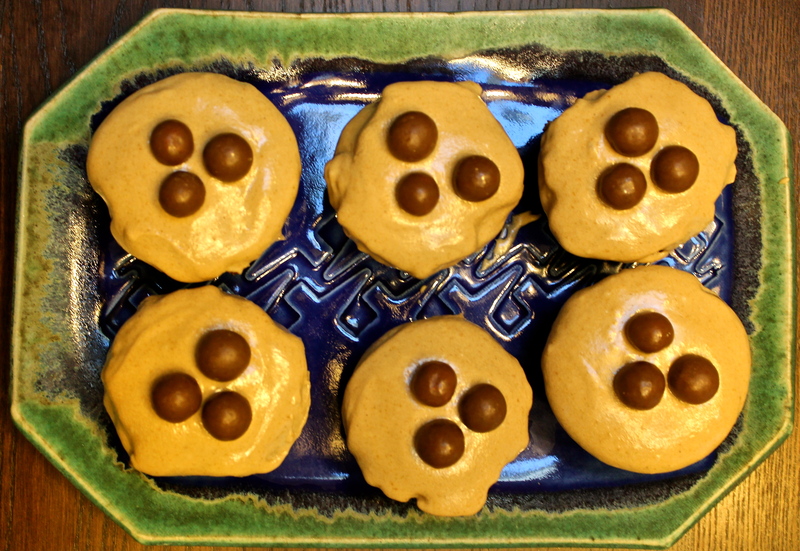 My Whopper Cupcakes started out as a cake of Nigella’s (Chocolate Maltesers from Feast) ; I was making the cake for a dinner party and I couldn’t find one of my 9 inch pans and so . . . cupcakes. And it turns out, this malted chocolate cake is even better in its American form as Whopper Cupcakes—especially if you are able to find—as I inadvertently did in one of my explorations in an Indian market—malt power with . . . are your ready . . . cardamom. In fact, we all love the cardamom Horlicks so much,that I have started to add more of it to the cake part than Nigella did. But the real secret to the one cupcake you have to try is the frosting which is, as my British friends say, more-ish. In fact, you might wish that these were overly large cupcakes with too much frosting. But, despite their name, they’re not–and that’s probably a good thing. Malted milk balls, as decoration (you can buy fancy ones or you can use Whoppers, which are the American version of Maltesers). Preheat oven to 325 degrees and line cupcake tins with lining cups. This recipe might make as any as 14 or 15 cupcakes. Whisk the sugars and eggs—while the mixer is running, heat the milk, butter and Horlicks powder in a sauce pan until butter melts and it is hot but not boiling. When the sugar and eggs are light and frothy, beat in the hot Horlicks mixture. Then fold in flour, cocoa, baking powder and baking soda. Pour batter into cupcake tin (around 3/4 full) and bake around 20 minutes until the cakes have risen and spring back when pressed gently. Cool them on a rack and remove. When they are completely cool, you’re ready to frost the cupcakes. Nigella suggests making the frosting in the food processor—she says that eliminates the need to sift the confectioners sugar. In all honesty, I’ve done it in the mixer and I’m not much of a sifter and it’s worked out fine. In any event, blitz confectioners sugar, cocoa and Horlicks in the processor to remove lumps and combine and then add the butter and process again. Stop, scrape the sides and start again, pouring the boiling water in the funnel until you have a smooth buttercream. The last time I made this, I added a little more water and it was a softer consistency that was easier to spread and it still became firm. 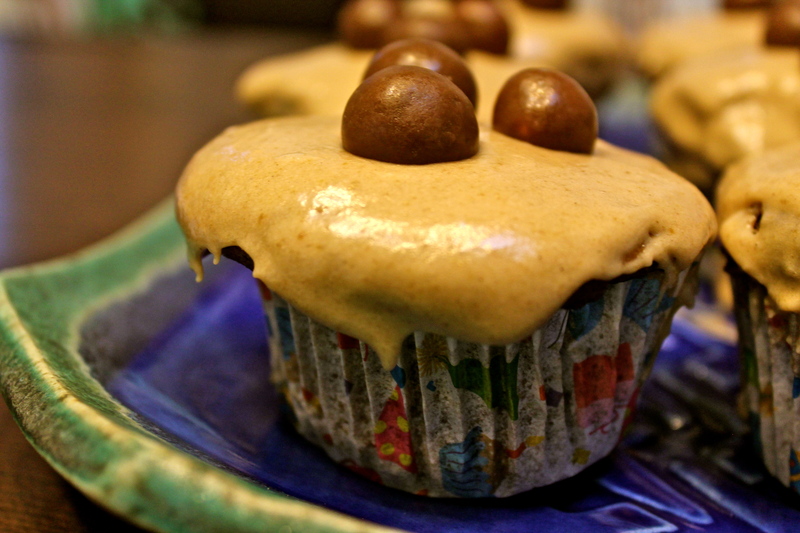 Decorate the cupcakes with malt balls.